Registration is closed. See you at the audition! 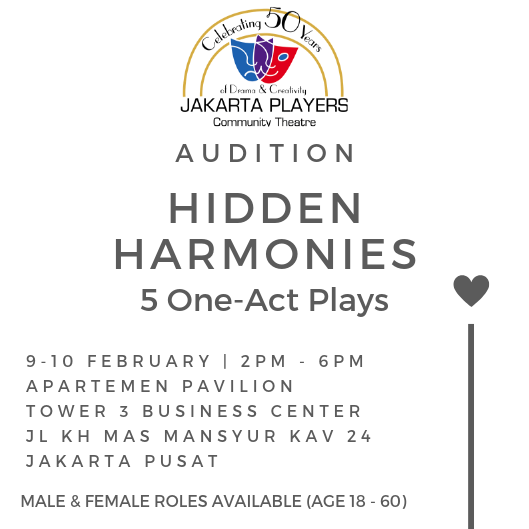 The Jakarta Player’s Hidden Harmonies, five one-act plays about relationships. There are many kinds of connections developed between people, but only the best kinds of relationships will produce a beautiful albeit surprising harmony among the noise. Join our audition for a chance to discover new connections and make memories. Previous theatre experience is preferred, although not necessary. You will not need to prepare anything before the audition - just show up! In preparation for the production, you will need to be available for two rehearsals a week (evenings/weekends), so please only audition if you can commit your time to these rehearsals.